Last time I checked we had over 200 people in the Mystery Stole Along group. We're starting Friday, so if you're interested in this, go ahead and sign up. There's still room for more! Just in case you missed the first explanation of this here's another one. We'll be making a stole (long rectangular shawl) but the directions will be given in small parts and you won't get a finished project picture until you get your stole done (this is the mystery part of it). It will be approximately 5 weeks (but we might stretch it out some to allow for things like sleep and food in the middle), getting one step of the directions a week. If you're interested, there is a button in my sidebar that will take you to the Yahoo group so you can sign up. Even if you can't get your yarn by Friday, you can still sign up and catch up when you can. Come on, we'd love to have you! Why yes, we did get Caleb Big Boy Legos this weekend, how did you guess? I decided he was ready to make the move from the huge Legos for toddlers up to the little Legos for big kids, so being the sensible mom that I am, I sprung for the 1000 piece set. After all, if it ends up all over the house, what's the real difference between 500 and 1000 tiny plastic things? 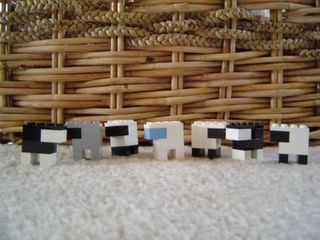 Watching him play with them, I had a flashback to building Legos when I was little and for some reason I remembered making sheep. I don't know if my brother remembers this or not and I don't know if this is how we used to do them, but Caleb got a kick out of his little flock this morning when he woke up. Sheep Geeks among you will notice that there is a Blue Faced Leicester in there. In knitting and spinning news, I've been working furiously on the Mystery Stole and I'm pretty sure I can get it finished or near finished by this weekend, which will be really nice. One thing good about doing it right before the "launch" of the knitalong is that its still pretty fresh in my mind so I should be able to anticipate any trouble spots that might come up. I am also halfway through with the Guardians of Lipstick singles and if I put some time in on it during the evenings, I might get it done this week too. 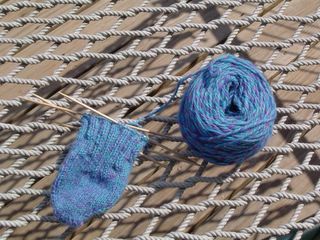 I finally started the second sock from my spindle spun Romney lamb's wool and alpaca. I finished the first one back in March or early April. To refresh your memory, this is a three ply yarn with each of the plys dyed a different color (teal, blue, and violet) with the Wilton's cake decorating colors. The sock in progress likes breezy, warm days, laying in the hammock and long walks on the beach - actually, its never been to the beach, but it might get to go to swimming lessons next week. For some reason, the second sock seems to be going much faster than the first one, but I have no idea why. In other news, I might have lost my mind. Feel free not to comment on that one, Mom. I've been thinking that it might be fun to have a Hazel Rose square loom. They remind me of the little hot pad weaving things we had growing up, but these are more for "big girls." I think Caleb might get a kick out of weaving on it too, and with weaving, you can use singles, where with knitting singles will make your fabric bias. Does anyone have one of these? How do you like it? How much do you use it? Try to talk me out of it! Finally, I went to Target this morning and they are carrying the Boots line of cosmetics and body treatments from the UK. I have heard of this brand but until now it wasn't available in the US so I'd never gotten to try it. I picked up some lip balm and a body butter sampler just to play with. If this stuff is as good as I've heard, I'll definitely be getting some more! Hi, another pictureless post. I promise a picture for tomorrow but not a whole lot to report today. We went to see the new Star Wars this morning and just let me say,"WOW!" If you haven't seen it, go! This is definitely one to see on the big screen. No photo today, but yesterday I got some back issues of Spin Off magazine that I had ordered. You know what's really cool about doing something that has been done for thousands of years? A technique or style of spinning that was valid then, is still pretty relevent now. A couple of the Spin Off's were from the 1990's. How many things printed back then would be valid now? And that's not even that far back! One of the magazines is from Winter 2001. As everything printed during that time does, it reflects and looks at the September 11 terrorist attacks. I wasn't spinning then but I was knitting. I was doing a striped turtleneck in the round with La Gran and I knit like a fiend. I channelled all my nervous energy into my knitting, and let me tell you, knitting is great for fidgety, nervous emotions. I don't remember how long it took me to finish the sweater but I know it wasn't long. It fits beautifully but I've never been able to wear it other than to try it on. I guess there is too much emotion knit into its fabric. I don't know if I'll ever be able to wear it but once or twice a year, I pull it out and try it on. After a couple of minutes, I take it off, fold it up and put it away. I guess as a sweater, its not really doing its job, but as a sponge for my emotions, a thing that literally absorbed my feelings of sadness, confusion, and fear, it was exactly what I needed. Like I said, I wasn't spinning then but I often wonder, since that sweater, how much do we knit or spin of ourselves into what we are working on? Meet Pancho the Poncho! I started this last fall with the tiny skeins of various colors I spun on my spindles. I change colors randomly and the stripes are random widths. I'm just kind of making it up as I go along. There are about 20-25 different colors of yarn in it. Its really a pretty fun knit but I haven't worked on it in a while. Obviously, there are a lot of ends to weave in and I have been making myself work in the ends as I go, but I'm thinking that I could just do the ends when I feel like it. Last night I didn't really feel like knitting so I ended up just watching TV and doing nothing. This would have been some prime Weaving In Time if I had needed to but there were no ends to weave in. I'm thinking I should get back on this as a break from charted designs and things that require major brain power. I've been working on the Mystery Stole a lot lately, so I'm scrounging a bit for Blog Fodder. The Mystery Stole is all designed and I have knit enough to know the design and charts are correct but I'd love to get this finished before the start of the knit along next Friday. I don't know if this is possible, this is Caleb's last week of school and we've got things going on every day this week. I haven't spun for a while either. Maybe tonight, I can sit down with Arwen and work on the Guardians of Lipstick. Hi Everyone! (Listening for an empty echo...) I just wanted to say that I'm still here. Didn't post at the end of last week because of some family stuff, just needed some quiet time. I'm late today because today was Caleb's class picnic and I stayed at school with him to help out. Tomorrow we'll return to our normally scheduled blogging but just wanted to leave a quick note as to where I've been. By the way, the Mystery Stole Along had 160 people in it last time I checked. I'm just in shock! See you tomorrow! Here is the Guardians of Fire Merino/Bombyx top from Blue Moon Spinnery that I'm spinning to ply with the glorious pinkiness of Monday's blog entry. I personally would have named it Guardians of Lipstick, but that wouldn't have really worked with the other colorways names, seeing as they are all Guardians of some element or another. This is wonderful to spin and since I only have two ounces, it shouldn't take too long (but I am spinning it finely so you never know). Those of you who are alert to the goings on here at Pink Lemon Twist might be wondering, whatever happened to the Merino/Tencel top I was spinning? Well, I'll tell you. I have finished spinning the singles and decided to try something new before plying it. Since the first bobbin gets to sit a little bit while I spin the second bobbin, the twist settles down is no longer active (dormant maybe?). If I ply it with the second bobbin as soon as I finish spinning the second bobbin, I'm plying the dormant twist of the first bobbin with the active twist of the second bobbin. I'm not sure that it really matters but I thought I'd wait a little bit so they could both settle down and relax before I ply them. As soon as I finish the lipstick singles, then I'll ply the Merino/Tencel. I'll let you know how my little experiment goes, since I know you are all just holding your breath with the suspense of it all. I only have a minute, and no time for pictures, so today I give you a public service beauty tip. Winter's over in most of the USA so get your dry, flaky skin ready for its public appearances this summer with a quick and easy sugar scrub. Take 1 cup brown sugar and add 1/2 cup olive oil. Scrub it gently over your entire body, starting at your feet and working your way up. Do not use on your face. Then, just hop in the shower and wash as usual. Don't worry about the soap washing away all of the oil, it won't. I actually do the scrub in the shower with the water off, it makes clean up really easy! Do this twice a week (you can do it more often on your feet) and you'll have soft, glowing summer skin. Also, you spent next to nothing by making the scrub yourself, so go reward yourself with some more yarn! Happy Tuesday! You know what's great about being female? Aside from not having to worry about zipping yourself up? Its PINK! I just love the color pink. It comes in the palest ballet pink, to knock your socks off hot pink, to dark and moody raspberry pink with everything in between. Pink is the only color powerful enough have an overdose level. I mean, you never hear someone say, "There was just so much blue there, it made me sick to my stomach." But overdose on pink and you can make the whole world queasy. Its just that powerful. Now supposedly men are starting to get into pink, but I don't seriously see that sticking around for long. I think pink is and will always be a celebration of women and all things female. Where am I going with this? 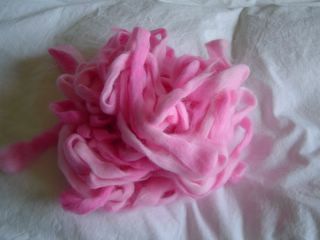 Well, this weekend I dyed the 2 ounces of kid mohair and angora (all together now...Oooooooooooh) pink. I used the new pink Easter egg dye color and I got the prettiest shades of pale pink. It ranges from a ballet pink to a pale bubblegum. When its spun it will be soft and fluffy and the angora will bloom in the most lovely, girly way. 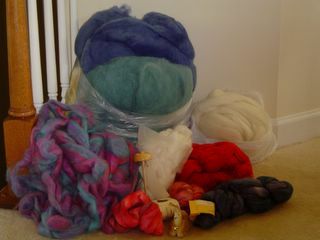 I'm going to ply it with the merino and bombyx silk top I also got at MDS&W from Blue Moon Spinnery. Its called Guardian of Fire and it basically has every shade of pink, coral, salmon, and plum that currently reside in my lipstick stash. It should be gorgeous, dontcha think? By the way, just in case you were wondering, my favorite color is blue. Yes, I've been spinning! I'm halfway through the second half of the Merino/Tencel singles (so I'm 3/4 of the way done). I plan on getting the rest spun this weekend. Plyed too if all goes well. There is no picture because it looks the same as the first half of the singles, which you saw a couple of days ago. So, since there is no knitting I can show you and you've seen the spinning, go check out the sidebar. I have a new blog pet. Pink Kitty was the name of my childhood sidekick (actually, Pink Kitty and my belly button were my best friends, but that's another story). Pink Kitty was patched, bandaged, and mended together so many times, I think there's more to his mending than there is of him anymore. Anyway, go check out the new Pink Kitty of the blog. Click the "more" button for a cat toy to play with him or just circle him with your mouse. Just a little Friday Fun over here at Pink Lemon Twist! Enjoy! These are the sleeves that I'm redoing for the sweater I finished last fall. Try to contain your excitement! The only other knitting I'm doing right now is Mystery Stole, and you're not getting a peek at that. What you're looking at is actually both sleeves. I knit both sleeves at once from two balls of yarn. I hate working from two balls of yarn, but this keeps all my shaping identical, tension is the same and I never have to deal with the dreaded SSS (Second Sleeve Syndrome). 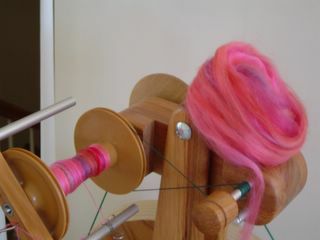 I did get a decent amount of spinning done last night during Fellowship of the Ring and I hope to get more done tonight. I feel like if I'll just actually sit down for any length of time I can get this spun up and then move on to some of my new stuff! Ramius gives the kitty sign of approval to the first half of my Merino/Tencel singles. It seems like its taken me forever to spin 4 ounces of this stuff. I know that Merino being a fine fiber and Tencel, also being lightweight, makes 4 ounces go farther than it would if it was just wool but this just seemed to go on and on. Tonight I'm going to start watching (again) the Lord of the Rings trilogy. Surely 3 hours of spinning for 3 nights in a row will put a big dent in the second half of this stuff. I'm dying to get started on some of the things I got at MDS&W (and if I plan to have it all spun by next year, I've got to get going). We have almost 100 people signed up for the Mystery Stole Along and I'm just floored! The actual knitting doesn't start until June 3, so if you haven't signed up yet and are thinking about it, there's still time to get in on the fun from the first. Feel free to share the info with anyone you think might be interested. Table Rock Llamas, my mother's LYS in Black Forest, Colorado actually has a sign up in the store directing people to the group. The more the merrier, I say! Here is what I got from MDS&W this weekend. Clockwise from the top back: Green and blue carded batts from Spinner's Hill - enough for a sweater, 1 pound of Shetland tops, 8 ounces of red Merino top, 4 ounces of a dark plummy/eggplant handdyed merino and tencel from Bonker's Originals, a tiny kneeling alpaca ornament, 2 ounces of hand dyed Bombyx/merino from Blue Moon (more pink than it shows in the picture), 8 ounces of a Mohair and wool blend from someplace I can't remember the name of, and in the center a Mini Bossie spindle of Bird's Eye Maple and 2 ounces of Kid Mohair and Angora roving that will probably be dyed pink or red and plyed with the bombyx merino. Can you tell I had fun? By the way, if you look in the sidebar, you'll see a button for the Mystery Stole Along. 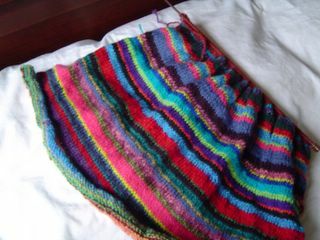 If you click it, you can connect with the Yahoo group for the knitalong. ( I know buttons do this everyday on the Web, but this is pretty huge for me, I've never had my own button) We're doing some testing right now to make sure everyone can get files with charts in them and I think we've almost gotten it figured out. I knit much better than I do computer stuff (remember when I figured out paragraphs? That was a big day for me) and Christine, who I've never met in person, is really being a huge help with everything. She designed the button for us and has answered many of my stupid questions patiently and in small words that I can understand. Big cyberhugs to you Christine! 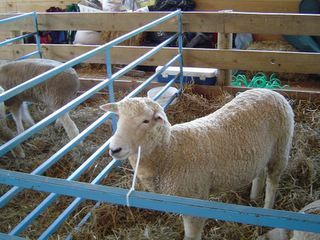 Of course, there were sheep. Fabulous, talkative, fluffy, gorgeous sheep. 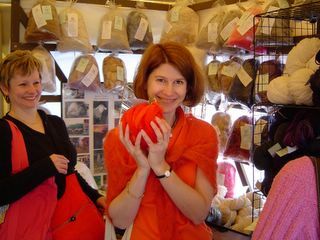 This is Claudia, who is the only woman I've ever met who looks fabulous in orange. If you look closely, you can see that she's wearing her Birch shawl. Birch is the first lace knitting I ever did and I just love that shawl. Mine however is a dark shade of rasberry called Poison (now discontinued unfortunately). 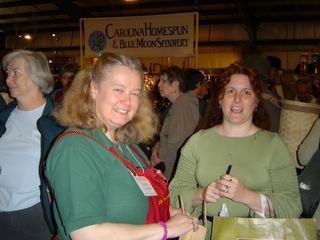 This is Sheila Bosworth (on the left), The Supreme Spindle Goddess with Shelley from Spindler's who almost had to leave her kids at the show because she had filled the car with fleece - and this was at 11:00 AM on Saturday! She claims that she made it home with kids and fleece, but you'll notice that there are no pictures proving this on her blog. Here are some of the Spindler's group. 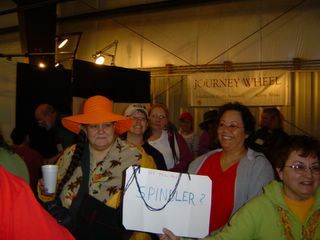 We met at the Journey Wheel booth on Saturday (and on Sunday too, for those there that day). Maryland was a blast of course. By mid morning Saturday the place was packed. I apologize to everyone I smacked into with my backpack. I had quite a haul this year (last year I wasn't spinning yet) and I'll show off my loot tomorrow. Those of you that I got to meet, it was great putting some names to faces. I hope everyone made it home safely. Hi, not much to report here. I've been getting my stuff together for the MDS&W tomorrow so not much knitting. I did get the Yahoo Group set up for the Mystery Stole Along so head on over and get signed up. I'll send out another copy of the supply list, start date information, and some other group stuff either later this weekend or at the first of next week - it depends on if I can tear myself away from my goodies! Christine has generously offered to make us a button which I promptly accepted (thank you, thank you, thank you Christine). Remember, I just learned how to do paragraphs. Hope you all have a great weekend and I hope to meet some of you tomorrow! Now, back to our regularly scheduled blogging. 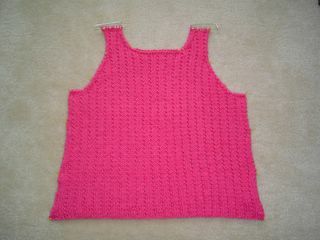 Here is the back of the tank from Blue Sky Cotton that I got last week from Knit Happens. I realized what color it is last week after I blogged about the yarn. It seems to photograph brighter and more obnoxious than it really is. The actual color matches the pink Peeps at Easter. That's right, I'm knitting a Pink Peep tank. I will also admit that just as soon as I finish writing this blog entry, I'm going back to that site to check out the fan club. I had originally planned to wear this top this weekend to MDS&W, but I think I've changed my mind. This yarn is a two ply of just barely spun cotton singles, which is why its SOOOOO soft, but I plan to wear a backpack to the show and I don't know what the shoulders of my sweater will be looking like at the end of the day. I'll probably wear Oasis instead since there is a lot more structure to that yarn. Make sure you say hi if you see me! I've been getting my shopping list together and I can't wait for Saturday. Knitting needles 4.0mm - 4.5mm (US 6-7) Use the smaller needles on the finer yarns, use a little bit bigger needle if you want something more sheer. Or just grab some in this range and go for it. Its a stole, gauge isn't crucial. I got a lot of great questions yesterday, so I'll try to get them all answered. If I don't answer your question, feel free to ask. OK, I've had a slight change in plans (don't panic, this won't affect you guys at all!) I had started the stole in a handspun yarn, but I realized that many of you will be using commercial yarn, not handspun, so you might like a sample knit in a yarn you can actually get, not just one that's exclusively mine. 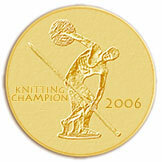 Also, a few of you were concerned about the cost of the yarn involved. 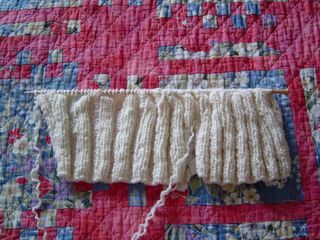 I am now using KnitPicks' Alpaca Cloud to test knit the stole. The great thing about this yarn is that its $3.99 a skein and 3 skeins will do the stole! Under $12 has got to be some kind of record, don't you think? 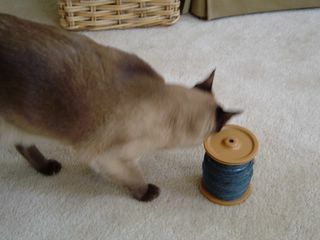 Any of you who are wondering about the quality of the yarn, don't worry, its beautiful, soft, drapey, and has been approved by Ramius, the cat with an Alpaca fetish (I have no clue how I'll block this thing). The KnitPicks yarn Shimmer, will also work for this project, just be aware that multicolor yarns don't show lace patterns as well as solids. I'm not trying to discourage anyone from this yarn, you just need to be aware of what the differences will be. Remember, any laceweight yarn will do, I just have 3 skeins of the Alpaca Cloud so I'll be using this. I'm working with needles that are 4.25mm. You can use either straights or work back and forth on circulars. As far as difficulty goes, this will not be a difficult pattern. You will need to pay attention, but very little lace knitting is the kind you can do on autopilot. You will of course need the know how to do yarnovers; knit 2 togethers; slip one- knit one- pass slipped stitch over; and slip one-knit 2 together-pass slipped stitch over. I will give the pattern in a chart form so that you will be able to see it both in chart and in your work, but it won't be so difficult to figure out, just put a post it note below the line you're working and that should keep you on track. When I was first learning how to read charts, I kept the list of chart abbreviations next to the chart and just kept referring to it as I worked. Someone was asking about size adjustments (tall people and people with broad shoulders need a longer shawl). These are easy to do and all you'll have to do is a few more repeats in the main body of the stole. I'll cover this as we knit it. I think this covers most of the questions I got. If you have more, just post them and I'll answer them ASAP. I plan to get the Yahoo group set up either this weekend or at the first of next week, but I'll let you know when its ready for you guys to go sign up. I think this is going to be so much fun! UPDATE: Remember when you're picking your yarn, synthetic fibers will not block. They'll just bounce back to where they were. You'll need to use natural fibers (wool, alpaca, silk, llama, cotton, linen, etc) if you want your lace to look like anything. Offhand, I don't know of any laceweight synthetic yarns, but I just want to give a head's up for any lace newbies out there! OK, this weekend I had what could be called a brainstorm, a flash of inspiration, or just a really silly idea...you tell me. First a little explanation. Many moons ago, I was a quilter (I guess I still am but quilting is not my primary activity on my own time now). In quilting there is a creature called a "Mystery Quilt." You would get a supply list for the project, and once you had your supplies, you would get the "clues." These would be the directions for the quilt. You would only do a little each week (or month, depending on how often clues were released), not really knowing what your finished project was going to look like until the end. It was above all, a leap of faith in the designer but it was also really fun. The thrill of the unknown, in a quilty kind of way. Another thing it was, was low stress. You could only do so much until you had to wait for the next "clue." OK, here's where we get to my idea. I wondered, why couldn't we do something like this in knitting? So here's what I think... If there are enough people interested, I will do a Mystery Stole for you. It will involve lace knitting (come on, you can do yarn overs) and the finished size will be about the size of the Feather and Fan wrap I finished last week (20-24 x 72-80 inches or so, whatever). I was planning on setting it up as a Yahoo group, like any other Knitalong. I'd like to see how many people are interested and if we get 10 or 15 or even more, I'll post the supply list and the group sign up information later this week. We'd actually start the knitting in late May or early June and I'm thinking one clue a week for 5 or 6 weeks. I'm using handspun yarn but that doesn't mean you have to. The new laceweight yarns over at KnitPicks would be perfect for this, and you can't beat the price. The pattern is my own design and I'll do it for free so there is no pattern charge. So, leave a comment to let me know who's in and get the word out to all your friends and we'll see if this is a really great idea or if I should just keep my ideas to myself.